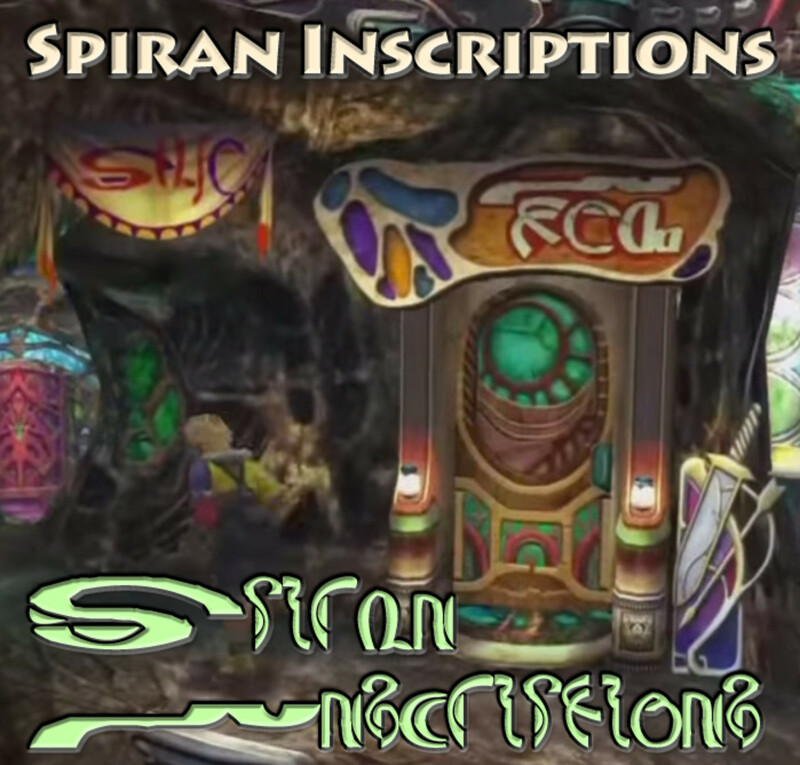 This is part III of my guide to the writing and inscriptions of Spira, the fictional world of Final Fantasy X. Part I covered everyday Spiran writing. Part II covered the writing of the Al Bhed tribe, a persecuted minority branded "heathens" by the Church of Yevon. 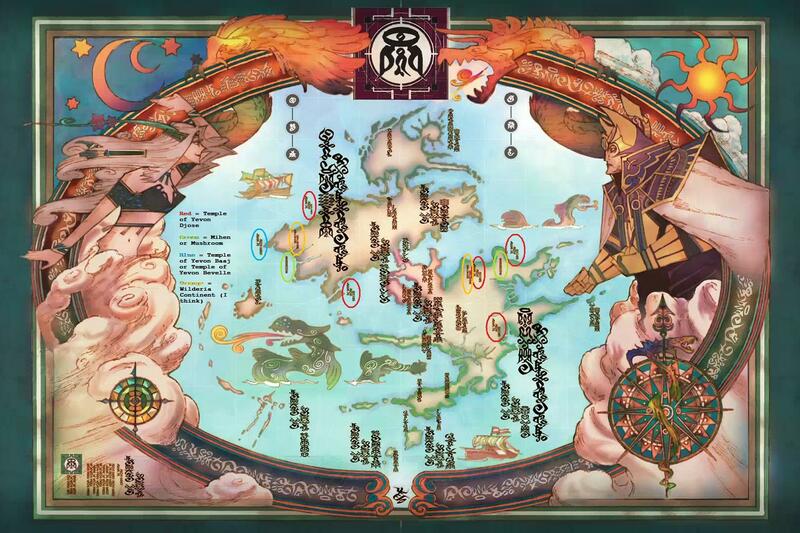 Now I'm going to look at the sacred Yevon script seen in temples, in summoning glyphs, and on the world map which serves as a transition screen for stops along Yuna's pilgrimage. 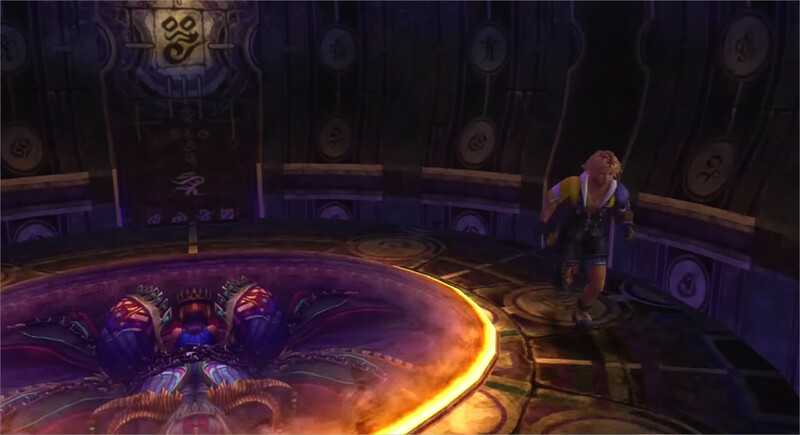 With grateful thanks: I used dansg08's fabulous FFX commentary/playthrough for in-game screengrabs. 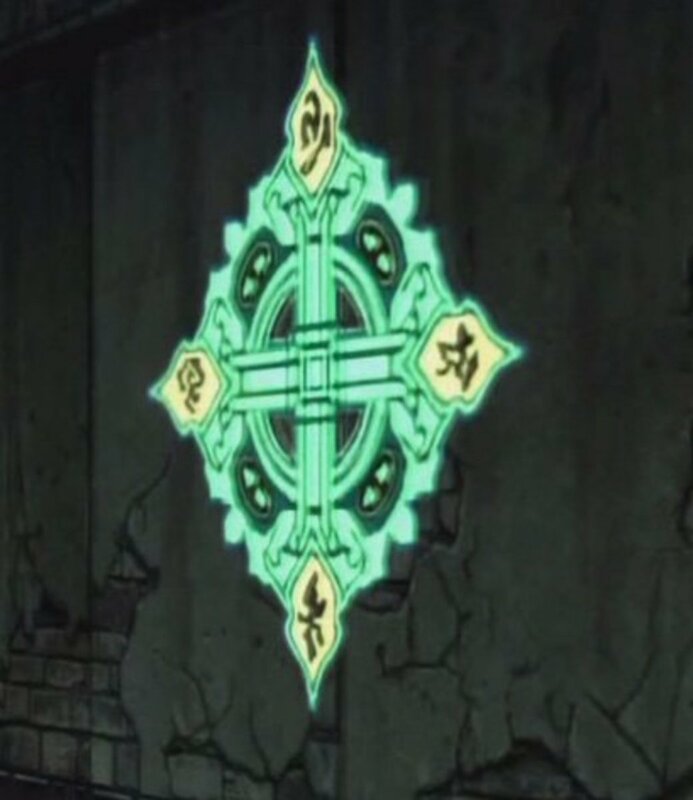 This snazzy-looking glyph in Besaid's Cloister is a compass rose, but I think it's been flipped vertically! Teleport pads use the same design, with "North" at the bottom. 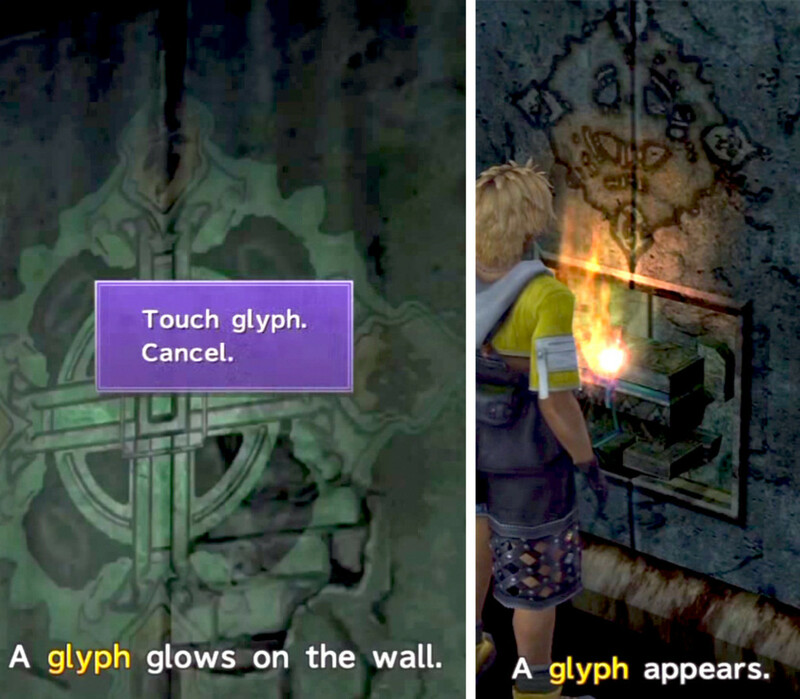 These signs are a fictional alphabet invented for Final Fantasy X. 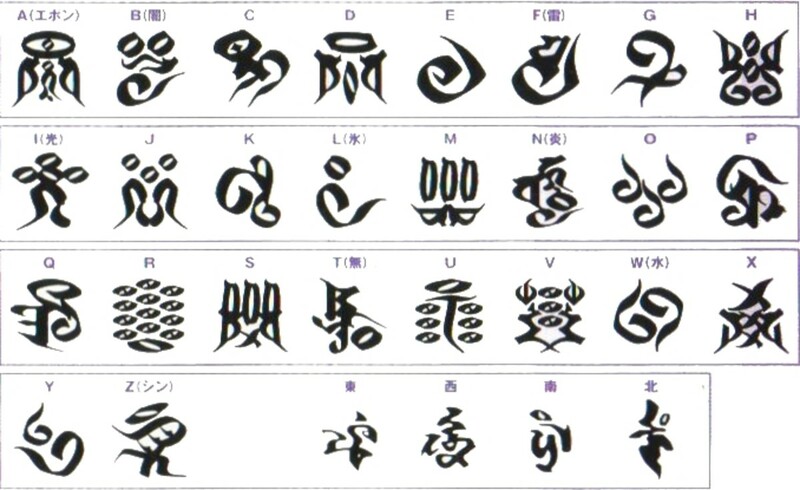 However, many of their shapes were inspired by a real-world sacred alphabet, Siddham Script, an archaic form of written Sanskrit still used by some Buddhist sects in Japan. Each sign of Yevon Script can be used in a straightforward fashion, to spell words letter by letter. Individual letters may also symbolize a religious/philosophical concept. The final four signs above are directional. In the Ultimania chart above, the kanji labels them in this order: East, West, South, North. Whoops! The graphics designers probably thought no one would be crazy enough to check. In older versions of this guide, I referred to the signs of the Yevon alphabet as "glyphs." I was wrong. 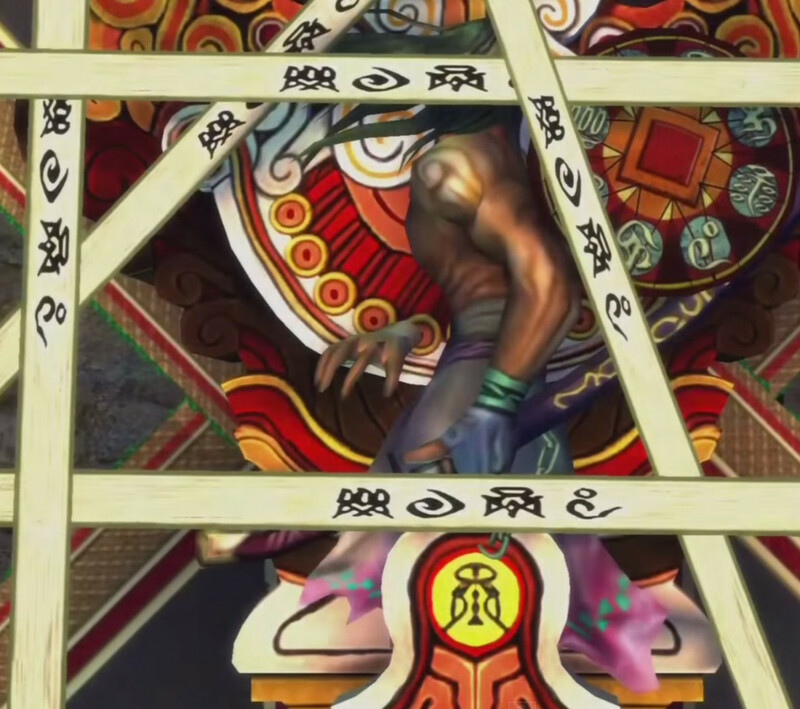 The game very specifically refers to those big, circular, abstract geometric patterns as "glyphs." Some glyphs are the glowing patterns of light that I call summoning mandalas. 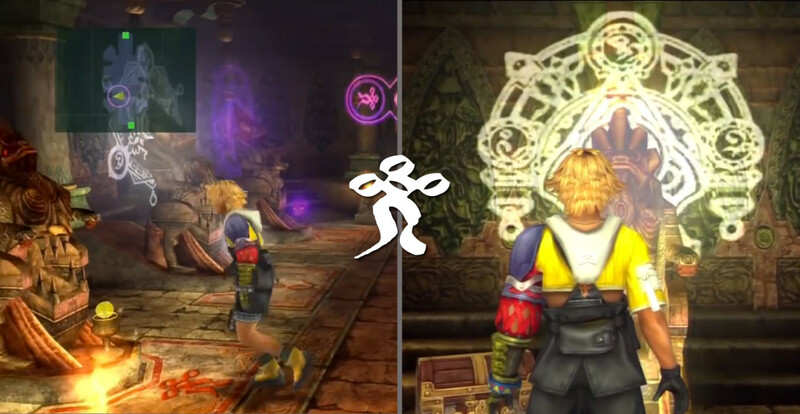 Others are symbols found in the temples' Cloisters of Trials: teleport pads, barriers, and magical symbols that raise doors when touched (right). World map with my labels added. Original Map of Spira. Zaon and Yunalesca frame the map along with a sun and moon. 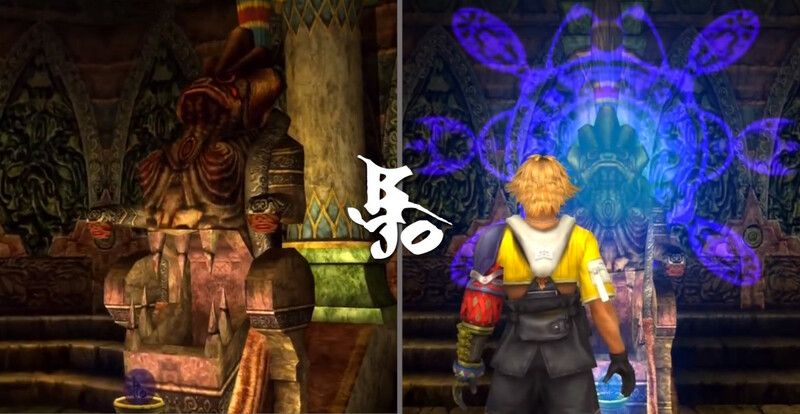 Remember what Tidus' and Yuna's names mean? Some names on the map are never heard within the story itself: the largely-unpopulated northern continent is Wilderia, for example, while the one dominated by the Thunder Plains is Djose Continent. 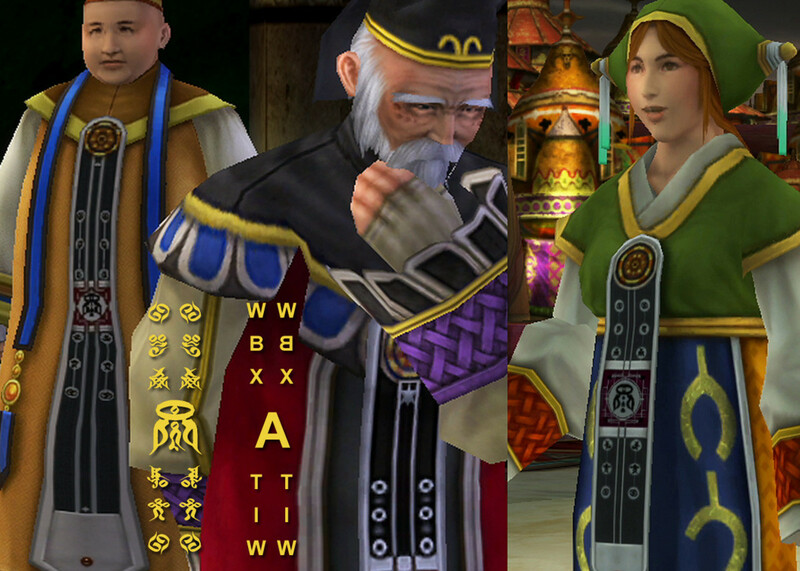 There's also lots of little, unnamed temples, suggesting other settlements around Spira. 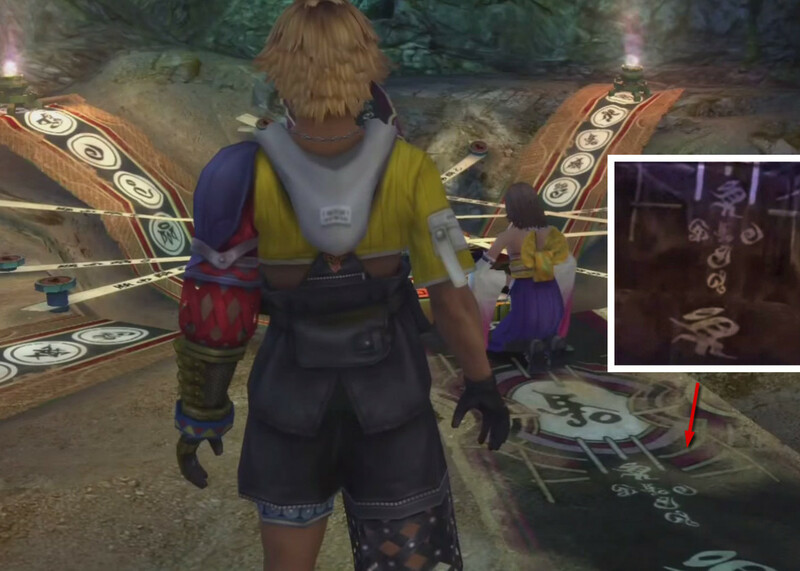 Yojimbo's Statue in the Sunken Cave - Can You Read It? 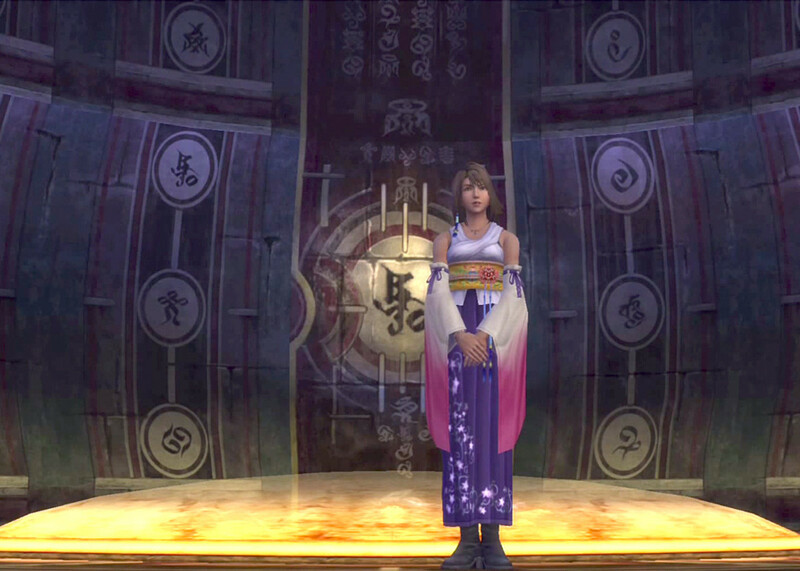 Here's the Fayth statue of Yojimbo laid to rest. Use the Yevon Alphabet crib sheet to translate. The strips of fabric forming a sort of symbolic cage say "SEAL." 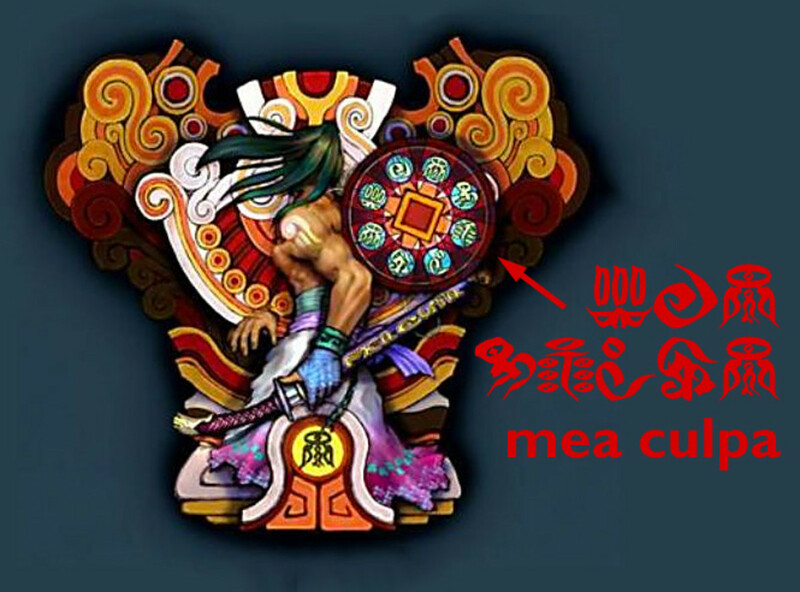 His sword and shield say "Mea Culpa" in Spiran and Yevon script. I'm guessing it's his sword's name, or perhaps his motto. Maybe he feels guilty for gouging us? This is surely the question that Paine holds in her heart throughout the story. 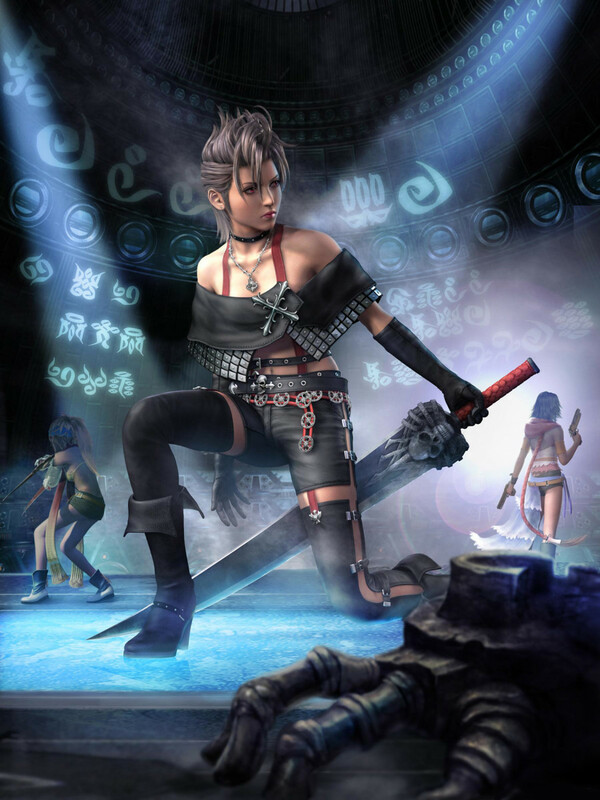 The poster's choice of setting is probably no accident: her old friends confront each other there over the same question, and it's the spot where Yuna's nightmares end in a hail of bullets. 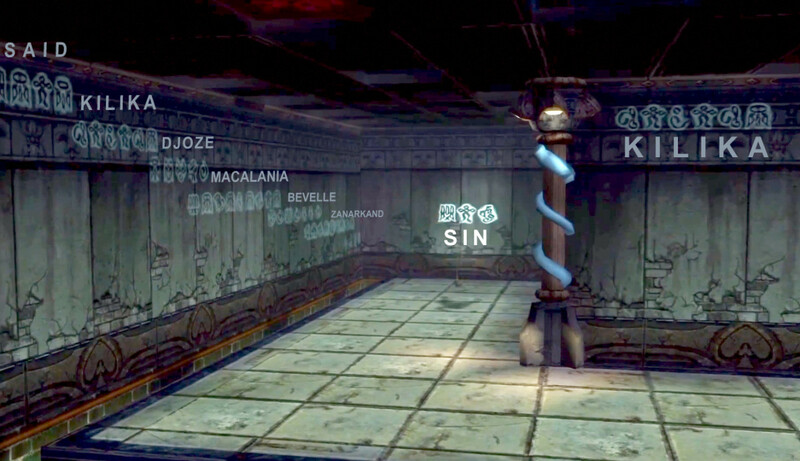 The walls of Besaid's Cloister of Trials are alight with ghostly words written in Yevon Script, detailing the route a summoner must take to reach Zanarkand and conquer Sin. Elsewhere in the Cloister, there's an Easter Egg: Baaj's name appears at least once. (I've never seen Remiem's.) Also, there may be a typo: it almost looks like the "D" of Zanarkand has accidentally been replaced with the "A" sign which looks very similar. 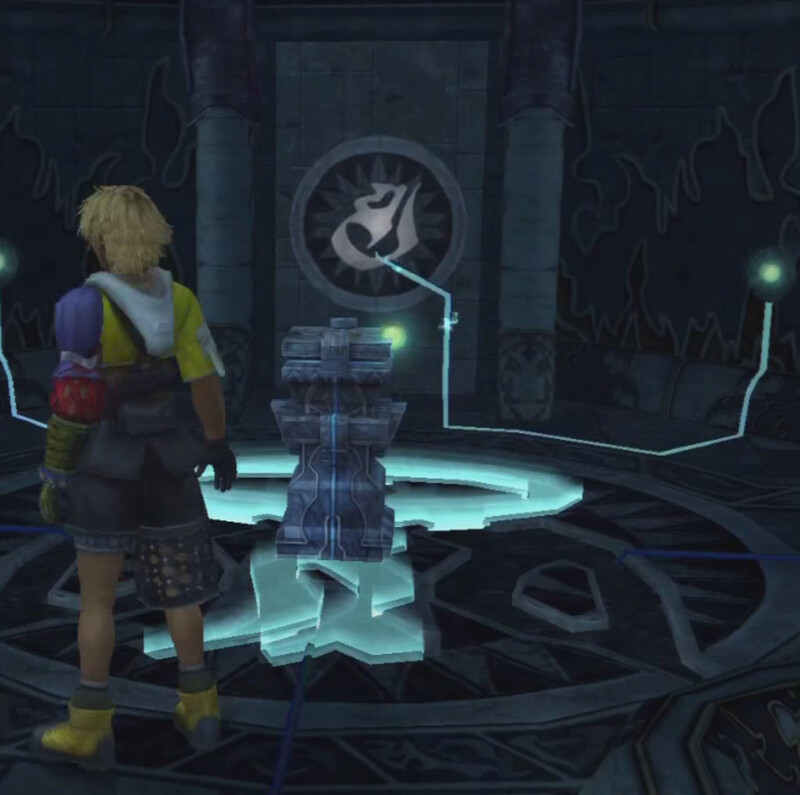 The name of BESAID appears as Tidus unlocks the end of the maze. Banners on the wall alternate A and Z signs. At the far end, above the lift leading down to Valefor's Chamber, there's a T symbol, beautifully worked in red. What's going on here? 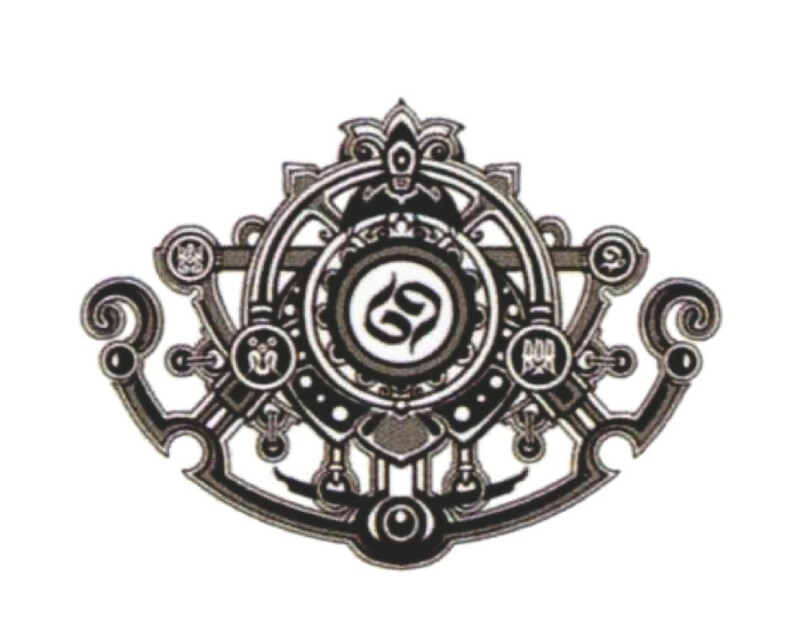 A stands for エボン, Yebon, i.e. Yevon. T stands for 無, Mu, the Buddhist concept of "no-thing." Mu is a sort of potential state: not yes, not no, not anything that can be labeled. It reminds us that the summoner's job is to negate herself. In the metaphorical sense, she's being selfless. In the literal sense, she not only has to negate her own sense of self in order to allow the Fayth's soul to join with hers, but in the end, she must sacrifice herself to defeat Sin. N stands for 炎, honoo, "flame, blaze." (It's the kanji for "fire" doubled). F stands for 雷, kaminari, "thunder, lightning bolt." L stands for 氷, koori, "ice." I stands for 光, hikari, "light." W stands for 水, mizu, "water." B stands for 闇, yami, "darkness." Z stands for シン, Sin. 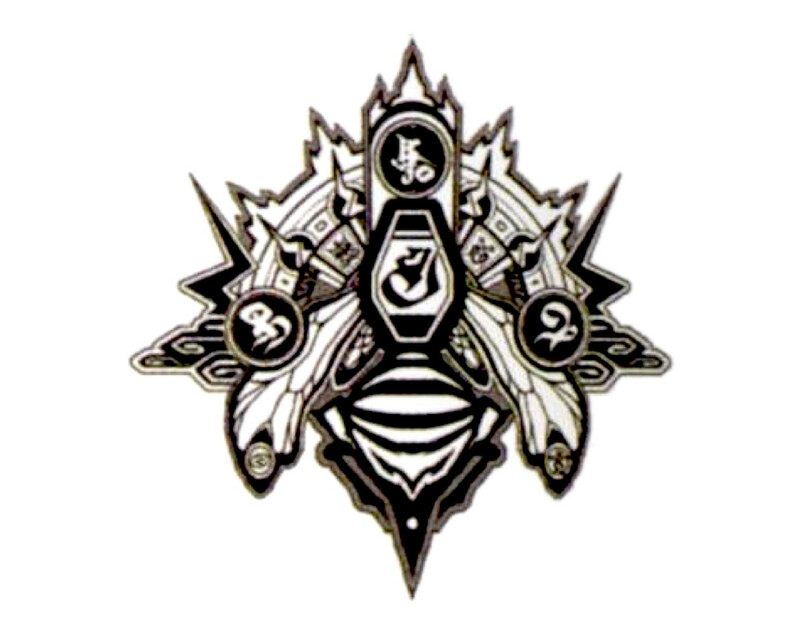 A/Z often appear as a pair, embodying the opposition between Yevon and Sin, Bevelle and Zanarkand, and perhaps the idea of Alpha and Omega, the beginning and end of the pilgrimage. 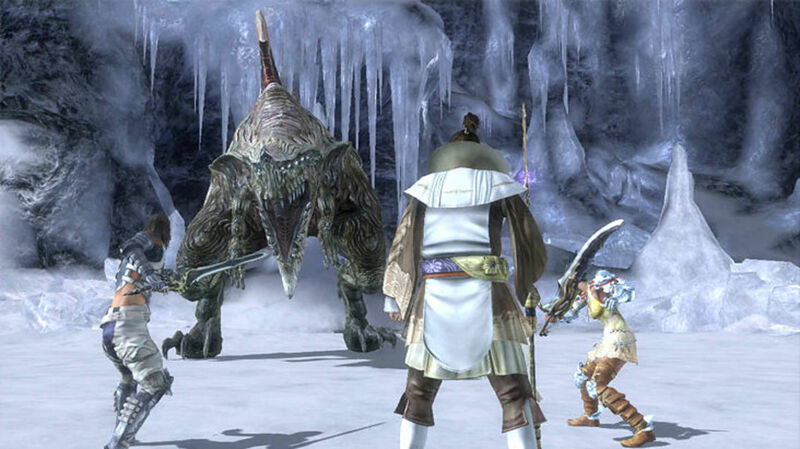 Here we see Seymour Omnis, calling his shots for your convenience. 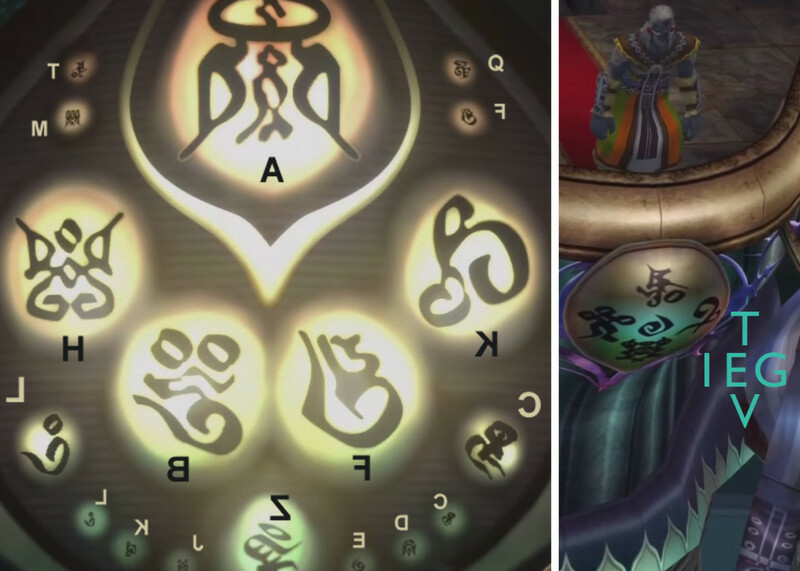 The symbols turned closest to him indicate which elemental magic he's going to cast next. He's really not very bright, is he? Right at the start of your very first Cloister of Trials, the church would like to remind you that you're walking the path of Yevon. Djose temple is just really proud of their Lightning Mushroom Rock, and slaps a "Thunder" sign on the wall. 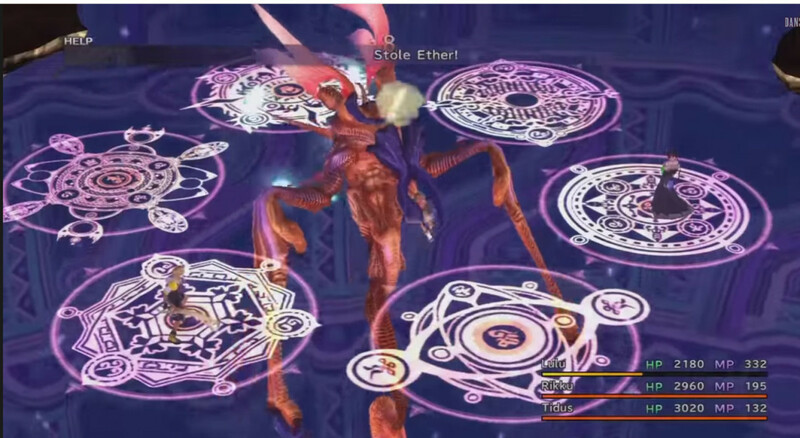 Also, you have to piece together Yevon's sign, like a summoner assembling her aeons. It's difficult to see, but this Macalania Sphere has a dark "ice" sign in the middle of it. 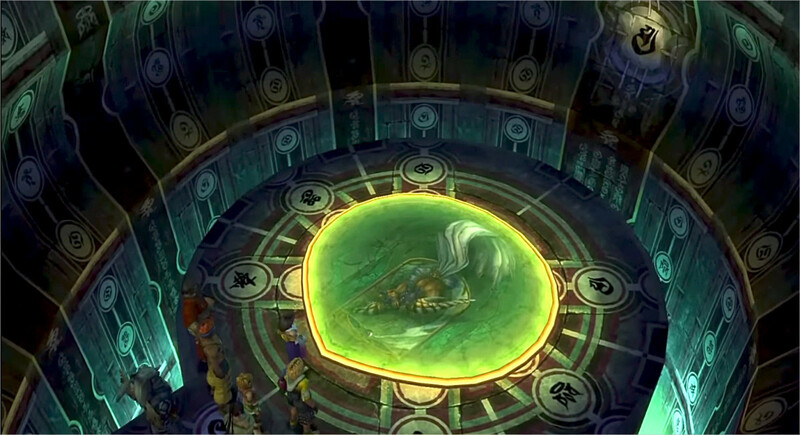 The Besaid, Kilika, Djose and Bevelle spheres are also marked, each with that temple's element. 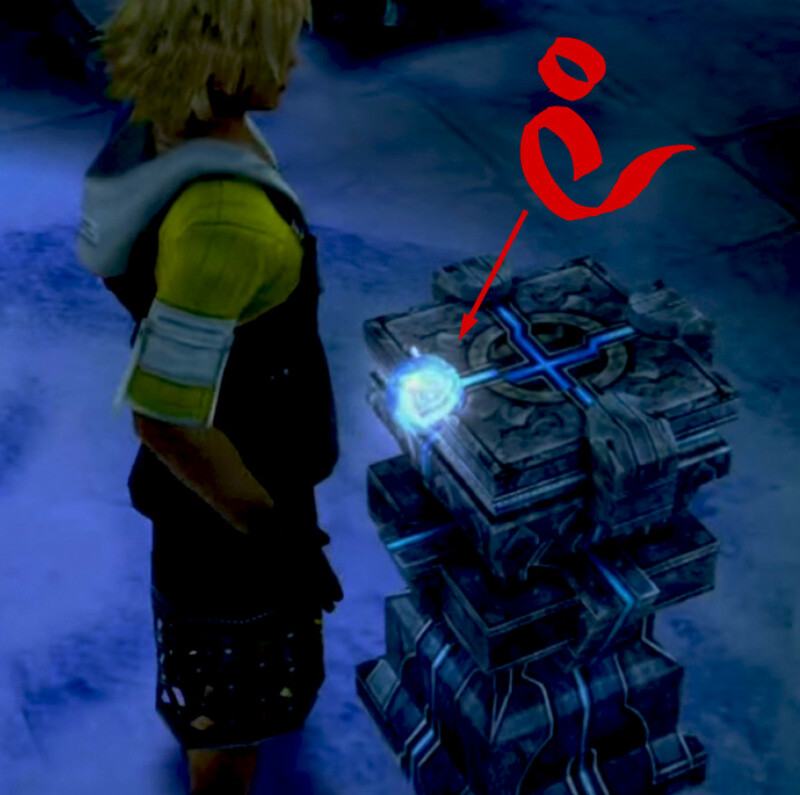 By nudging exposure/levels in Photoshop, I managed to bring out the "Light" symbol in this Bevelle Sphere. In Zanarkand, Sin looms ABOVE Yevon, an inversion of the usual pattern. 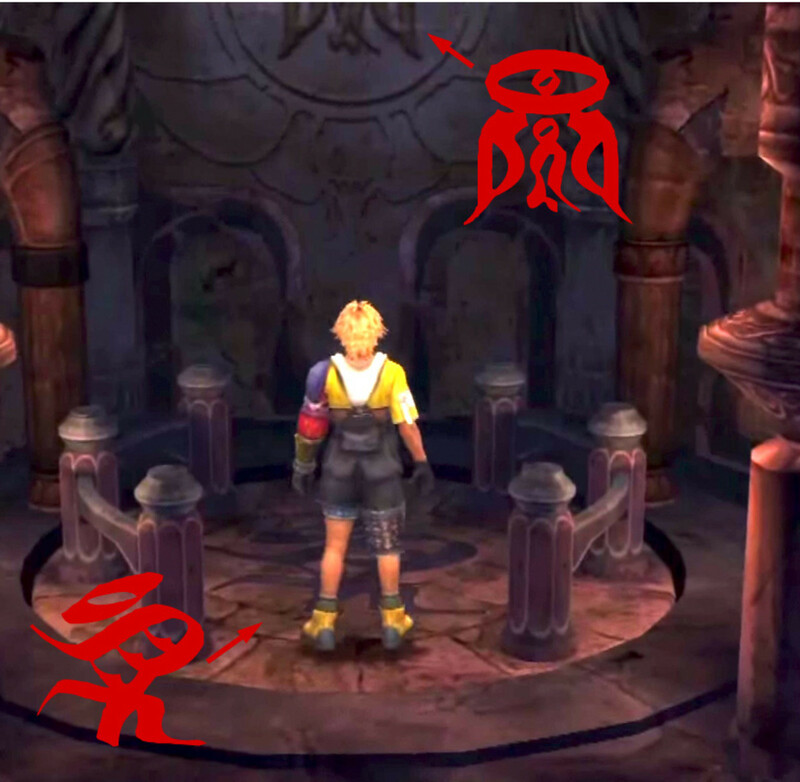 However, the prominence of Yevon signs in Zanarkand's ruins hints at the complex ties between Yevon and Sin. The Church of Yevon assimilates what it can't stamp out. 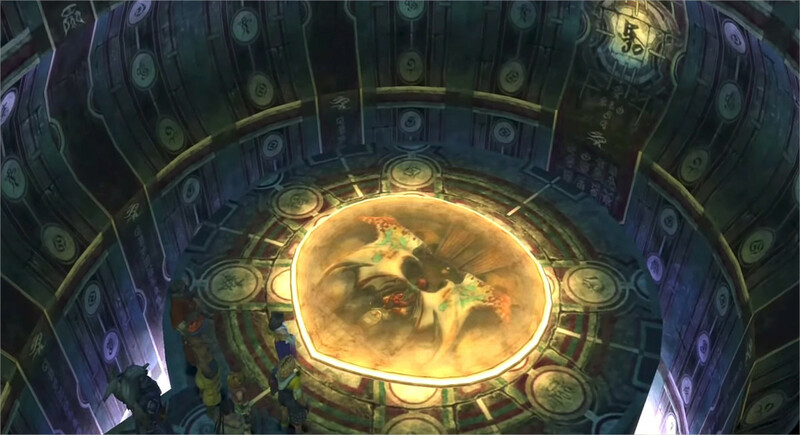 Bahamut's summoning glyph in the Bevelle Cloister of Trials. 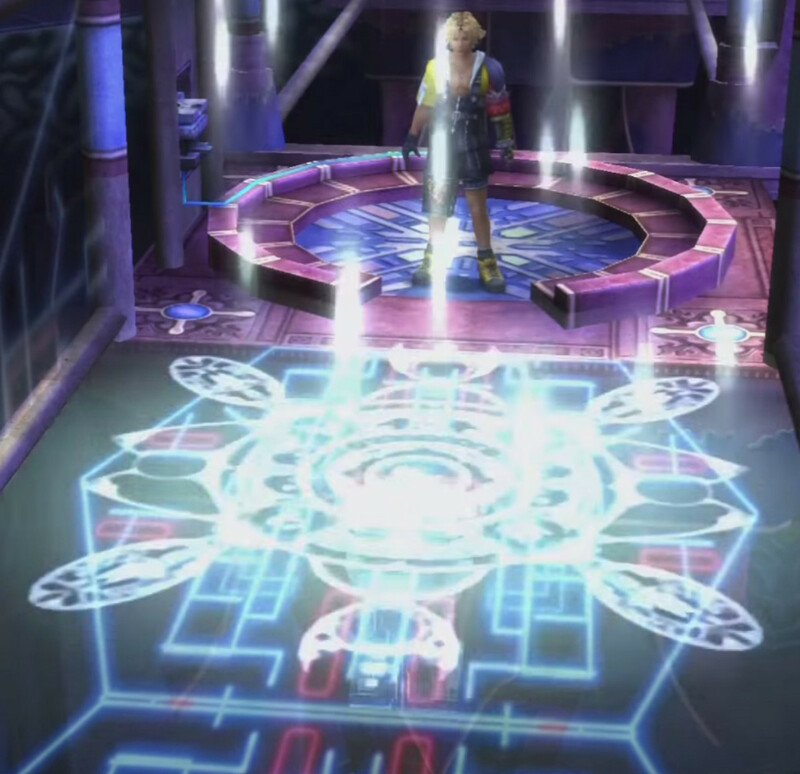 I've mentioned summoning glyphs, those mandala-shaped patterns of light that are associated with particular aeons. 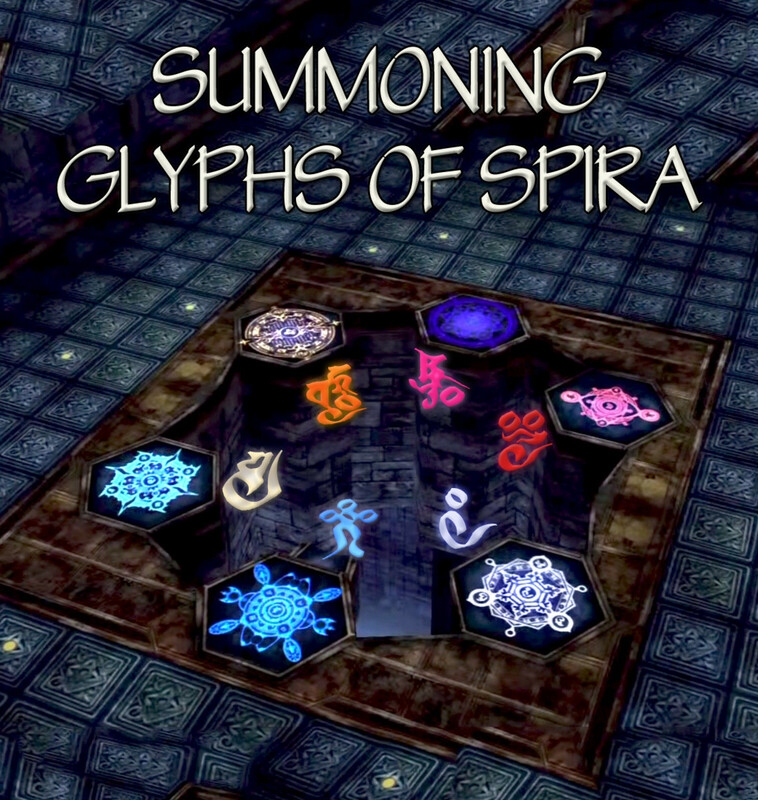 The summoning glyphs for some aeons appear as they're being summoned. Others appear in their temples. Still others only show up in the Zanarkand and Baaj Cloisters. 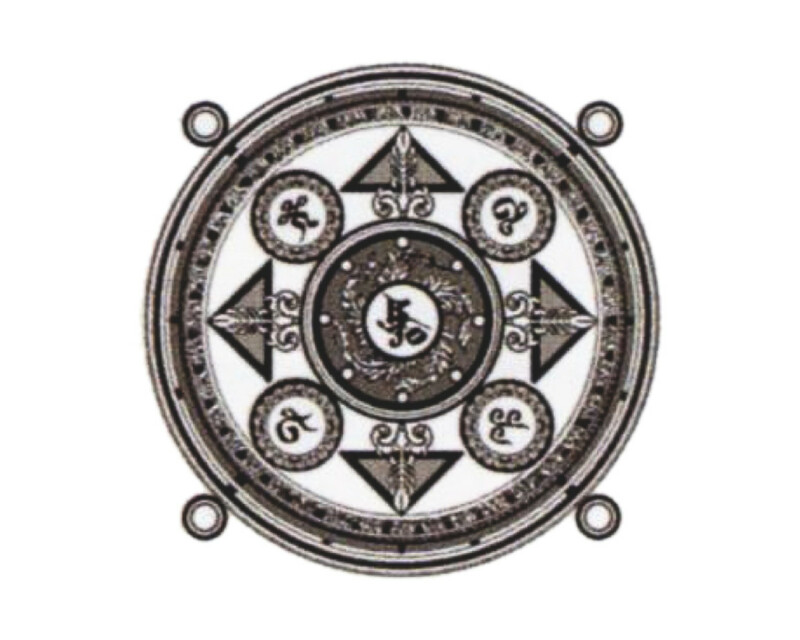 Each mandala has that aeon's main element in the center of the mandala, with 2-4 secondary signs around the perimeter. 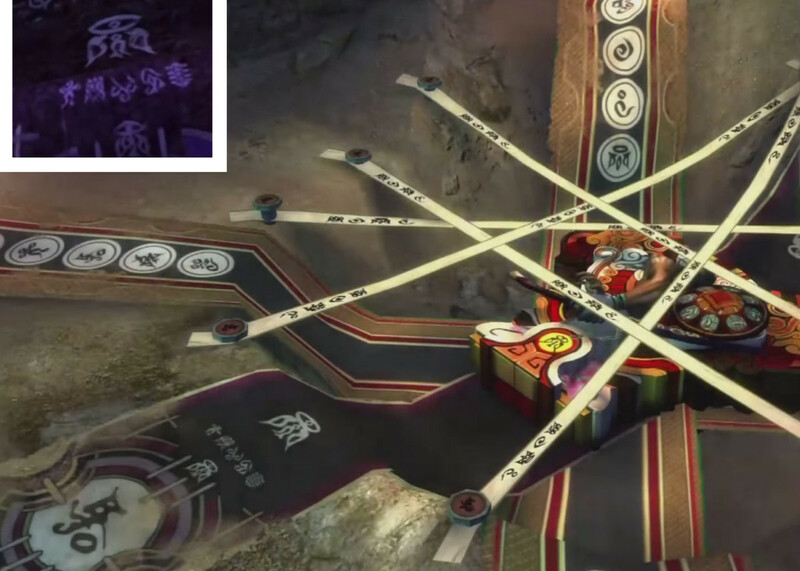 So we can find the Yevon Script signs for Yojimbo and the Magus Sisters by examining their glyphs. 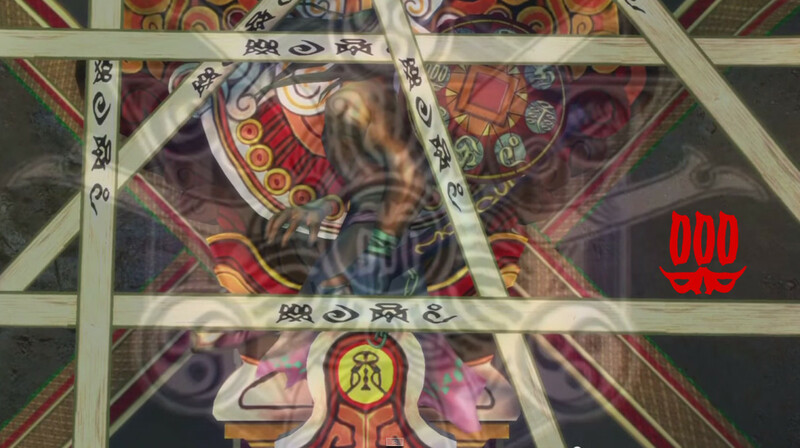 For a split second, Yojimbo's glyph is faintly visible. The Ultimania guide didn't tell us what "fundamental force" the M-sign (which is upside-down) represents. Perhaps poison, considering some of Yojimbo's attacks? 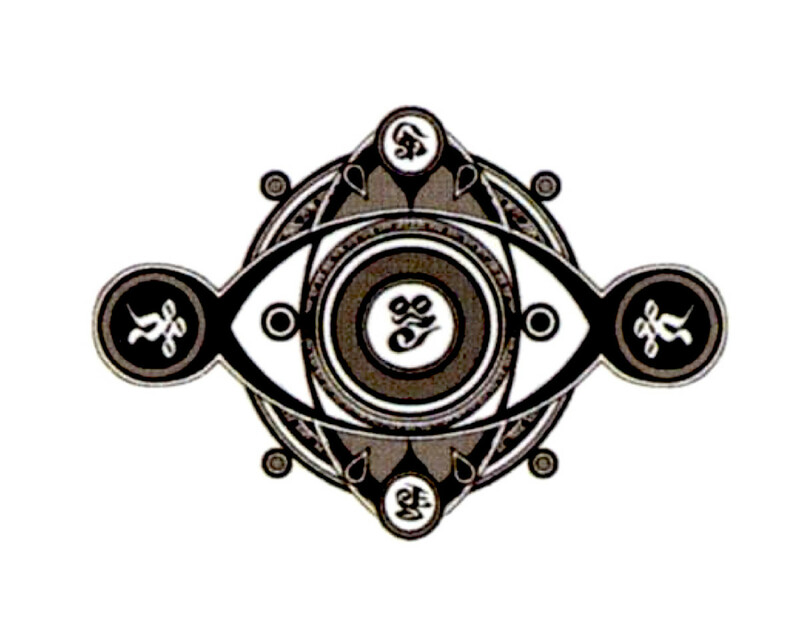 Anima's mandala has the N-rune of "darkness" in the middle (flanked by its opposite, "light," plus unknown P and Q signs.) It looks like this mandala has been flipped vertically! The Magus Sisters each have their own mandala. 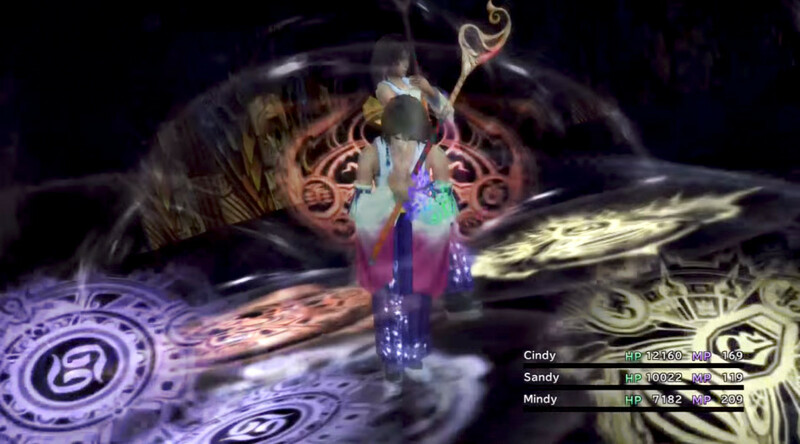 Cindy is Water, Mindy is Fire, Sandy is Lightning. 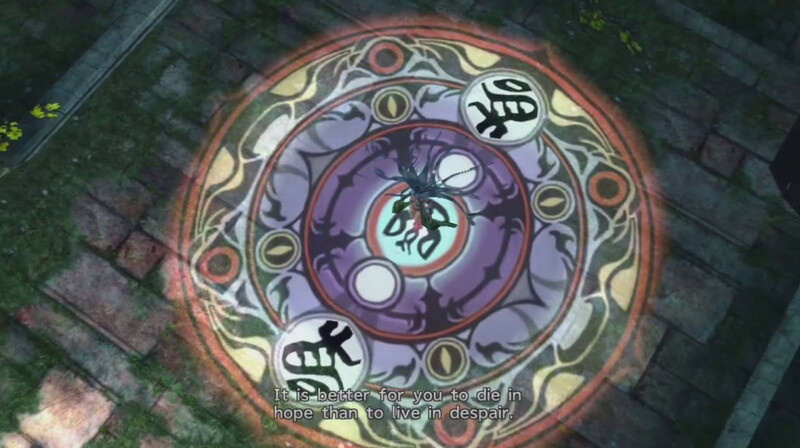 Is this the Final Aeon's summoning mandala, or Zaon's, or Sin's? I suppose all three. The Yevon sign dominates the middle, flanked by Sin. 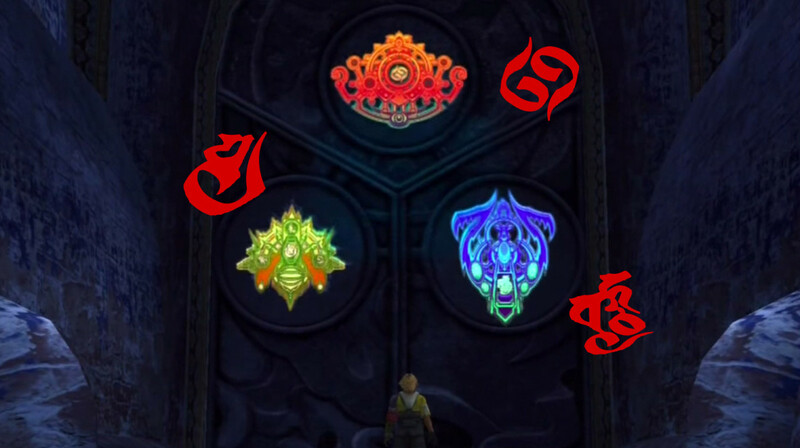 Zanarkand's puzzles require you to create or trigger the "elemental/fundamental forces" signs for each temple and its corresponding aeon, then the appropriate summoning mandala appears. Your party winds up fighting the Spectral Keeper, the guardian of Yunalesca's chamber, while standing on glowing forms of the summoning glyphs you've just activated. 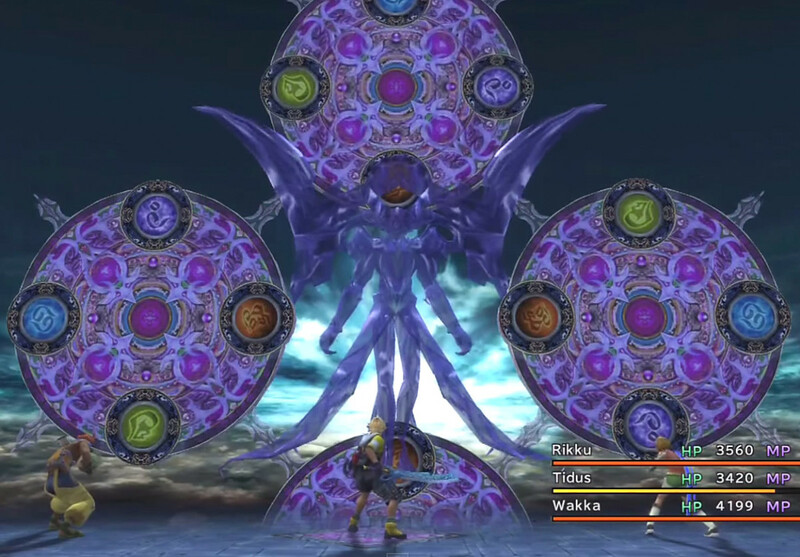 In theory, you couldn't have created those mandalas without first discovering their aeons, although we know that Yuna hasn't yet acquired one of them. 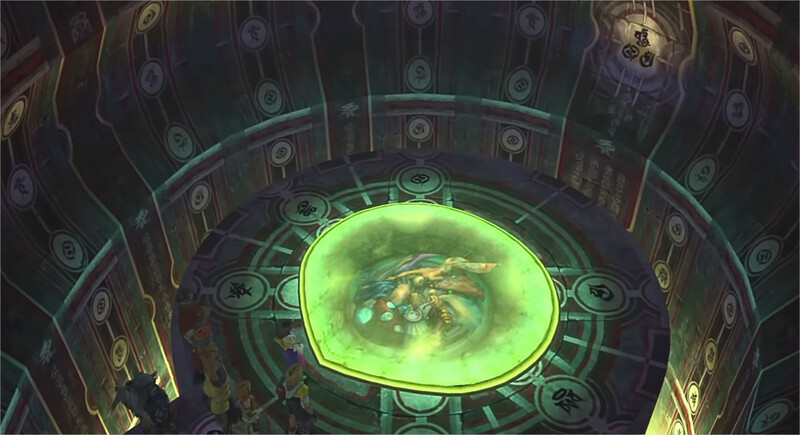 For Besaid and Kilika, you simply have to fetch their spheres and insert them into pedestal slots. Their sign lights up, then their mandala. Sorry these two are blurry; I had to boost the brightness considerably since the lights were out for these two puzzles. 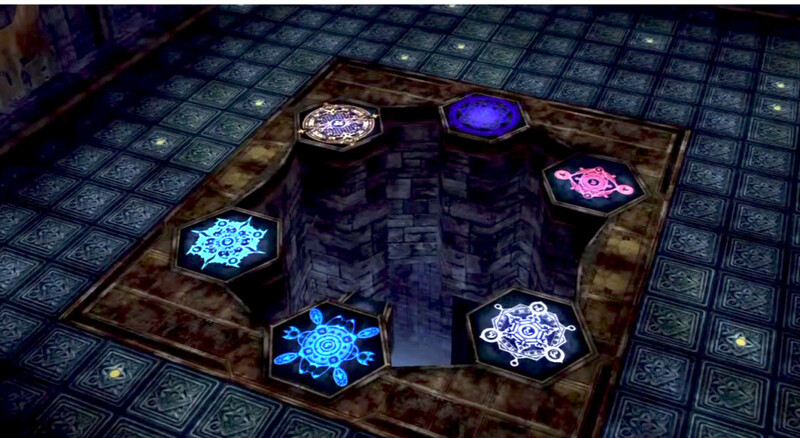 For the other four, you push in the pedestal to light up their Yevon-letter sign, a puzzle appears, and solving it lights up their mandala. That last was Ixion. Here's Shiva's sign and mandala. Next Bahamut. 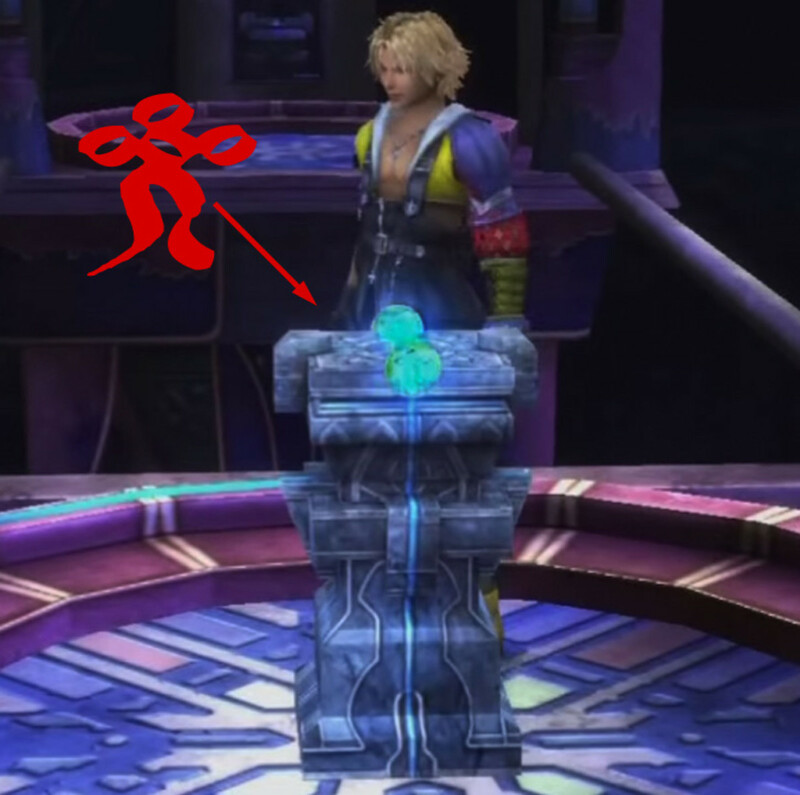 This "Light" sign is the same one that appeared in the Bevelle Spheres in his Cloister of Trials. 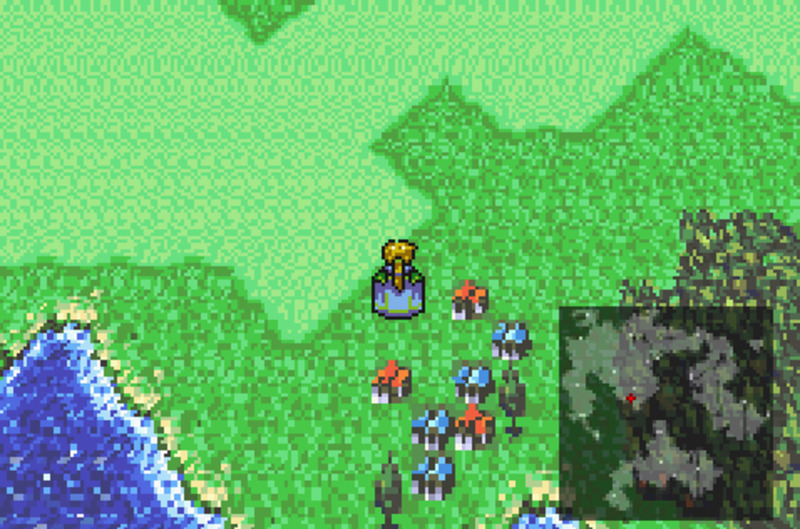 It's funny that Anima's here, since she's an 18-year-old Aeon. Maybe Yojimbo was here before? At which point this nasty piece of work tries to devour you while you're standing on them. 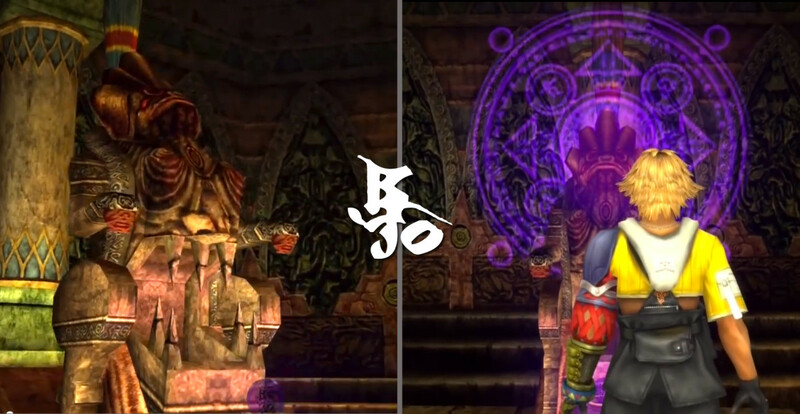 In Baaj, you once again have to complete a puzzle matching aeons, glyphs, temples, and mandalas. 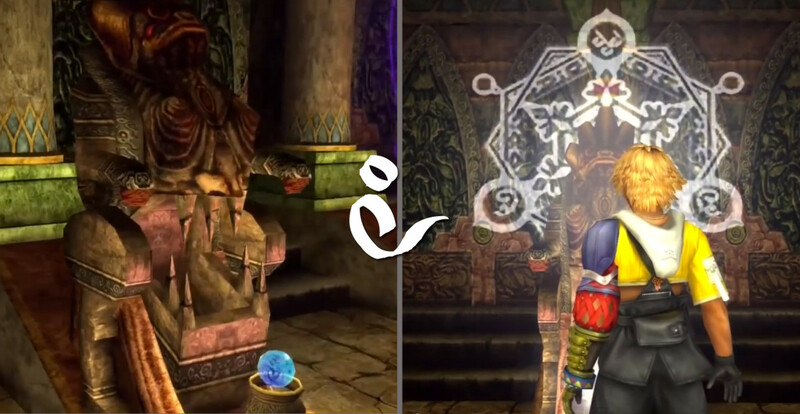 To solve each puzzle, you must go to each temple and open the treasure chest in its Cloister of Trials, then return to Baaj and touch a sphere sitting on a pedestal before the corresponding stone statue. 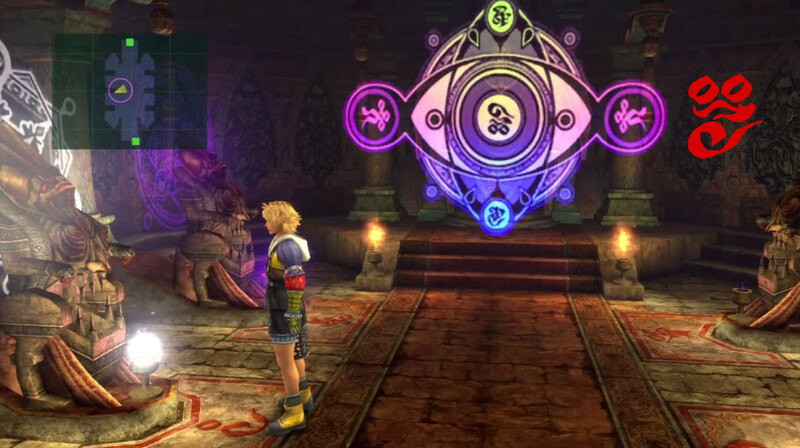 That sphere has an elemental-sign in it, and the matching aeon's summoning glyph lights up behind the statue. However, there's two anomalies in Baaj. 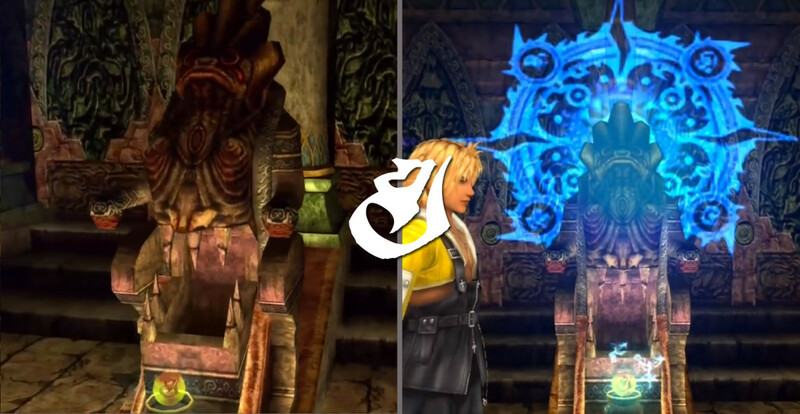 Zanarkand's Yevon-sign is "Light," while Bahamut's is "Mu," just like Valefor. Where did mu come from? In my Cloister of Trials photo gallery above, I showed that the Bevelle Spheres used in Bevelle's Cloister of Trials carried the "Light" sign inside them. 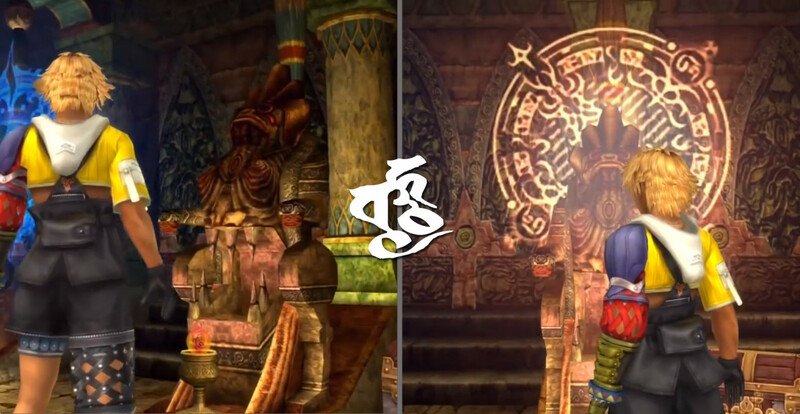 Also, the Zanarkand Cloister of Trials matched the "Light" sign to Bahamut's mandala. 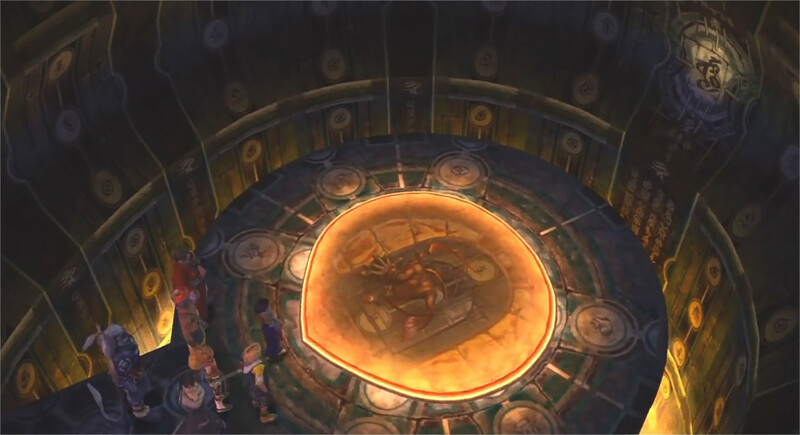 However, in Baaj, the sphere used to trigger Bahamut's mandala has a Mu sign in it, the statue has a Mu symbol on the floor in front of it, and the mandala itself has a Mu in its center. Bahamut can't seem to make up his mind. 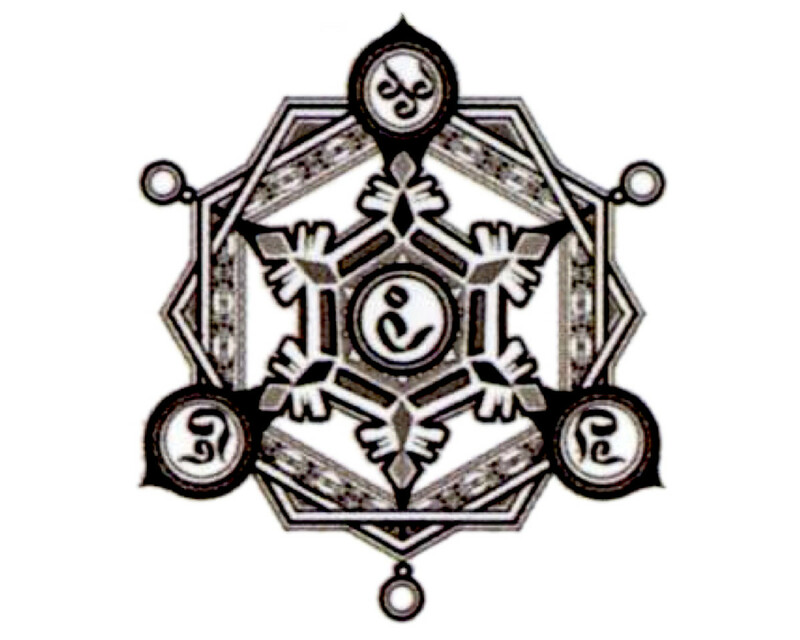 The Ultimania Guide gives us black-and-white versions of all the aeon's summoning glyphs, which I've scaled and tidied up below. 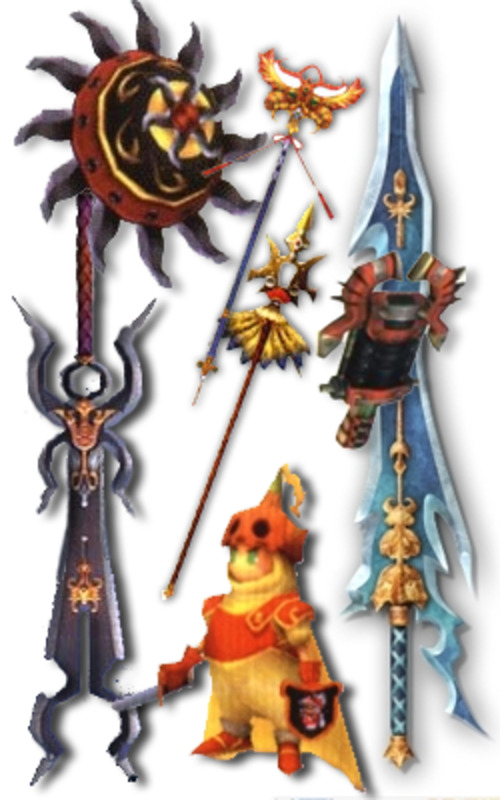 It's easy to see from these than in every case except Bahamut, the central Yevon-sign is that aeon's element/power. 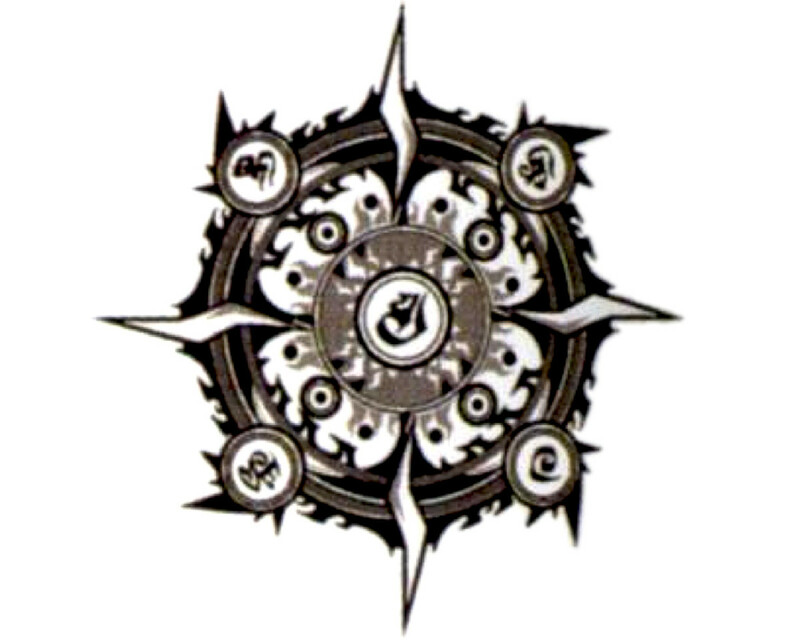 Bahamut actually has four summoning mandalas: he shoots down through all four glyphs as he plummets from the heavens. 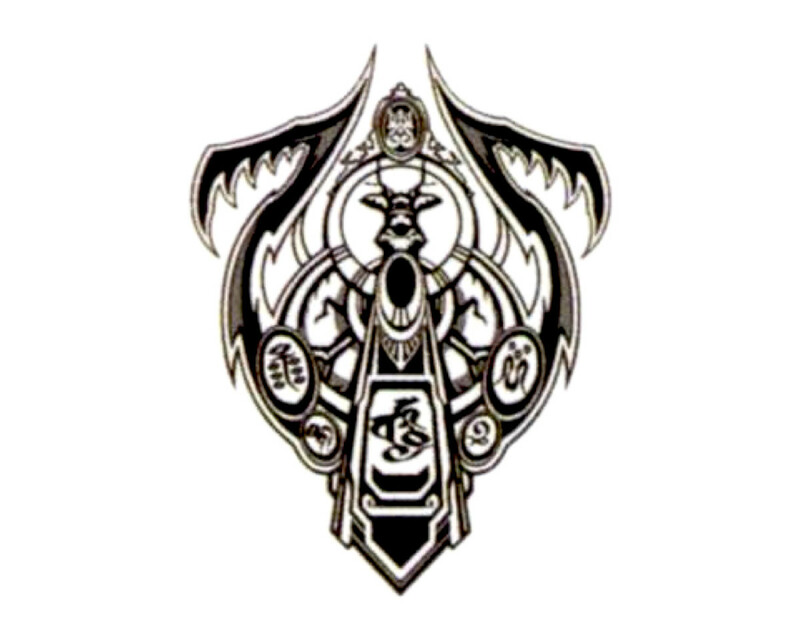 So, which is Bahamut's element: Light? Or Mu? Or both? Bahamut is an enigma. 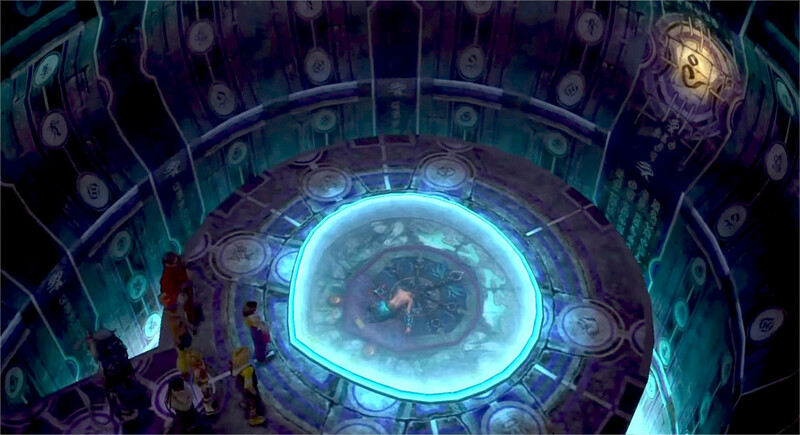 Youngest Fayth, most powerful of the storyline aeons, the only one seen to be able to leave his Fayth statue and wander around, even enter into dream-Zanarkand which lies suspended in that watery pillar on Mt. Gagazet next to the Fayth Wall whose dreams maintain it. Tricky little fellow. (Or big fellow, depending on your point of view.) I think his machiavellian characterization in Justira's story Clarion is very apt. 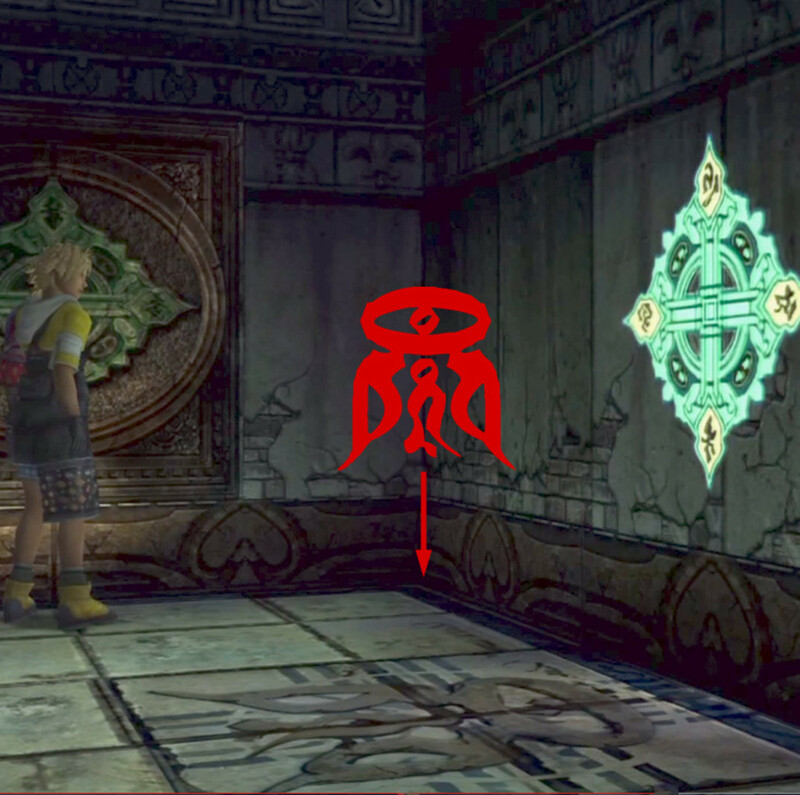 Oh, one last place that Yevon-signs show up in relation to aeons: they're on the back wall of the Chambers of the Fayth. They seem to clinch the "center of the mandala = aeon sign" theory. I'm really impressed by Yevon architecture. How are all these ramps and platforms staying up? But never mind that. 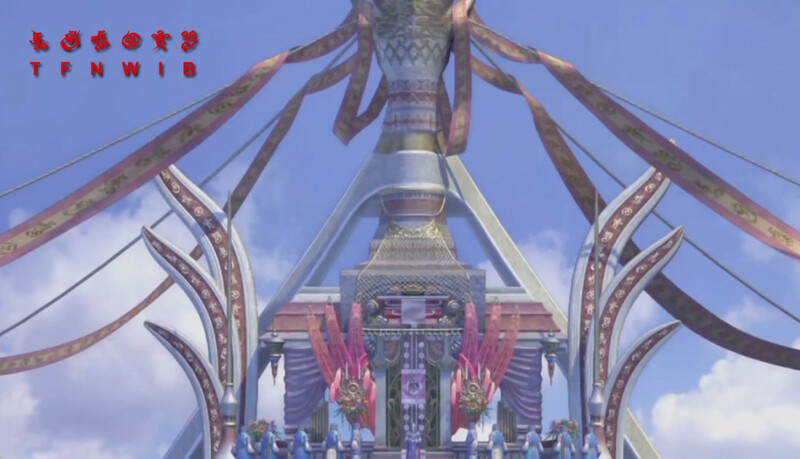 The church is decked out in its holiday best for Yuna's wedding, so banners, flags and signs are proudly sporting the signs of the "fundamental forces of the universe." Wait, where's Shiva's sign? Are you people INSANE? Do you know what the powerful fairy does when she's not invited to the wedding? Just as with Al Bhed Script, we'll occasionally find Yevon Script employed as mere decoration. The signs often appear to signify something— church hierarchy, scriptures, computer displays (blasphemy! ), or some kind of grouping with religious meaning (the five elements, the seven deadly sins, the ten great sages of Spira, or who-knows-what), but when I convert the signs into their English alphabet equivalents, I get nothing. I've given nicknames to groupings of signs that appear again and again: the Yevon cross, the Sin cross, the "Six signs of Yevon" (except it's not always the same six). These are just my own headcanon. Check out captions in the gallery for notes. Besaid Temple: two side rooms, with same inscription on the wall. I always assumed this was the Teachings of Yevon, but in the original game it was illegible. The signs are grouped to suggest words or sentences (if they're being used as concepts). "The High Court of Yevon is now in session." Left: above the Maesters' balcony. 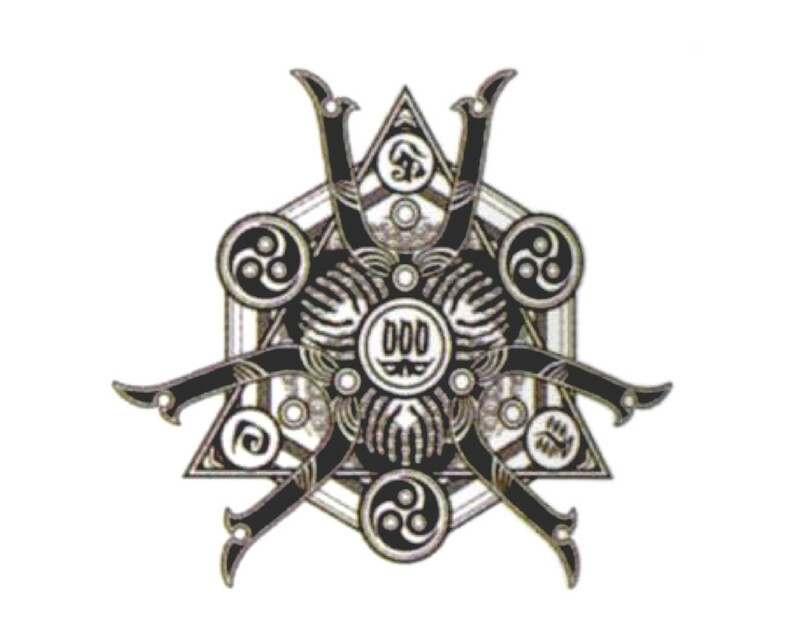 My headcanon is that it represents the church hierarchy, with Yevon's Name above the Four Maesters (Executive, Judicial, Religious, Military). No idea about the shield. 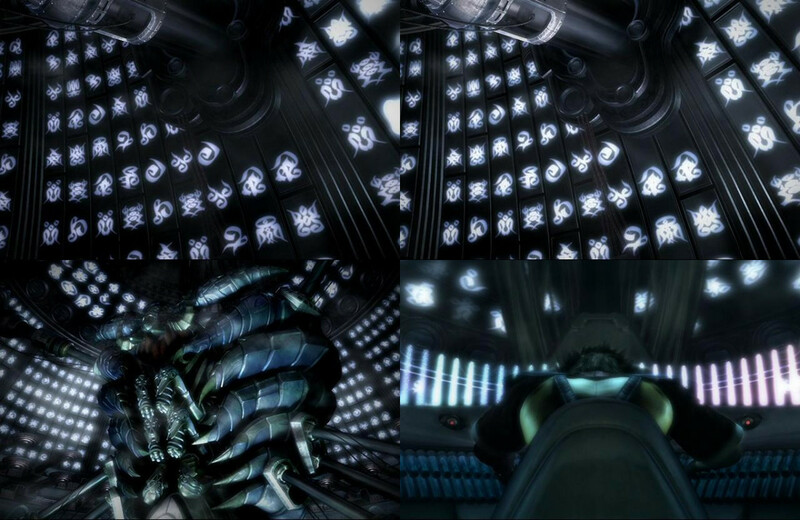 The "Six Signs of Yevon" T-I-W E-N-G, which alternate around the chamber walls. The upper and lower levels, however, have a different set of six. The "Six Signs" on a banner at the wedding. 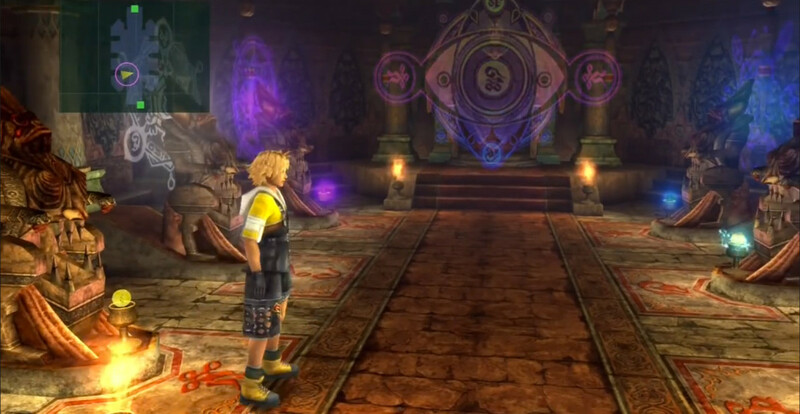 (Left: FMV, Right: In-game, which has them flipped horizontally. 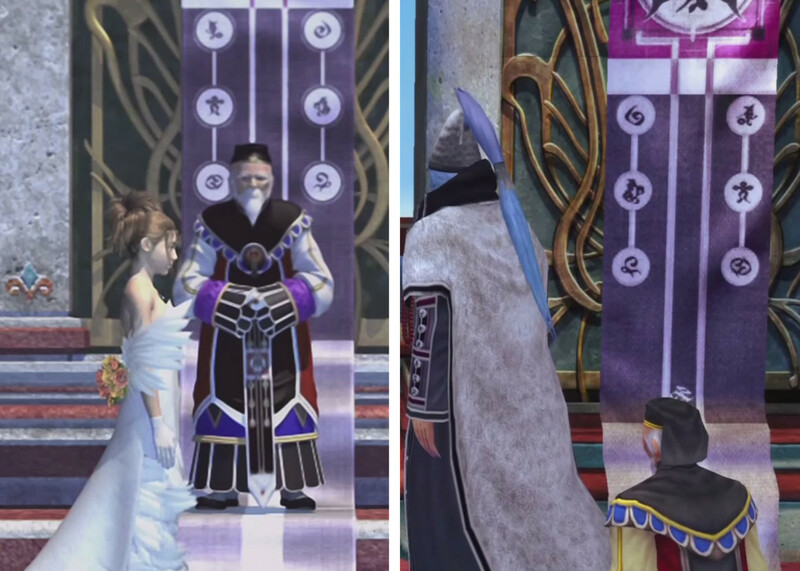 Seymour's ridiculous wedding get-up apparently has the "Six Signs" on the sleeves, but it switches to a different set of six (O-C-P T-N-K) once he's out of FMV-mode. "Sin Cross" in foreground, lower right. 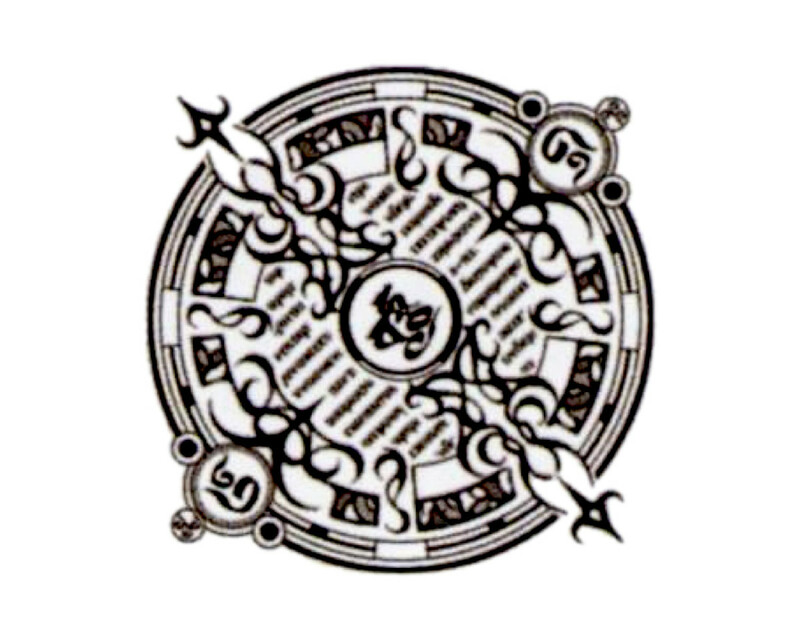 (inset is another copy of it from Bevelle Chamber of the Fayth). 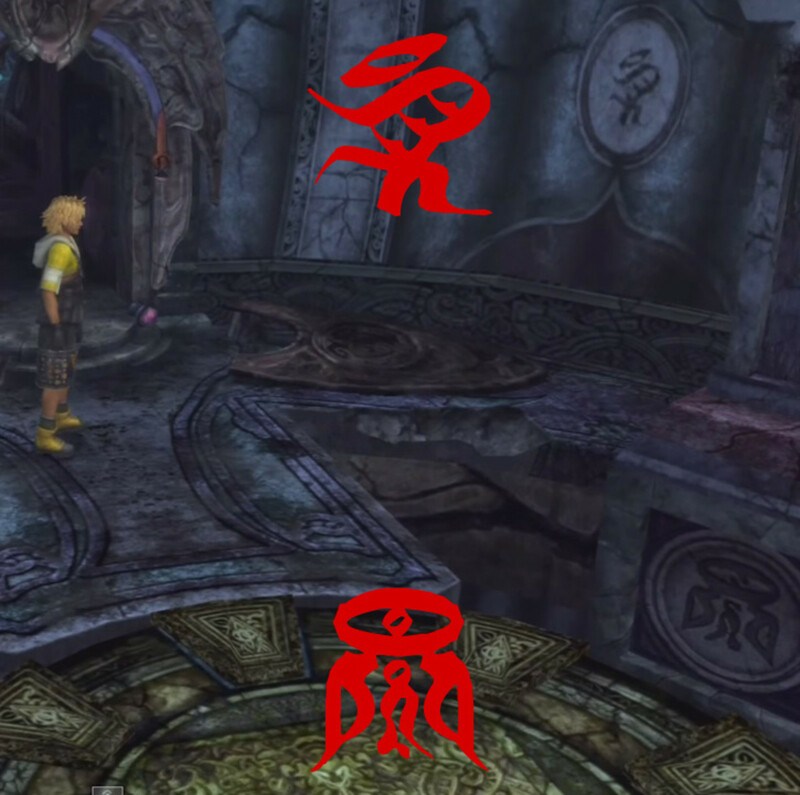 Vertical part of cross: Sin-T-F-K, Horizontal: P-T-E.
"Yevon Cross" at lower left with inset of same design from Anima's Chamber of Fayth. I-H-O-P-U with Yevon sign above and below. Yet another set of alternating signs grouped in sixes around perimeter, which spell gibberish. What I irreverently call the "toilet paper of Yevon," the signs seen on the vestments of clergy and maesters. 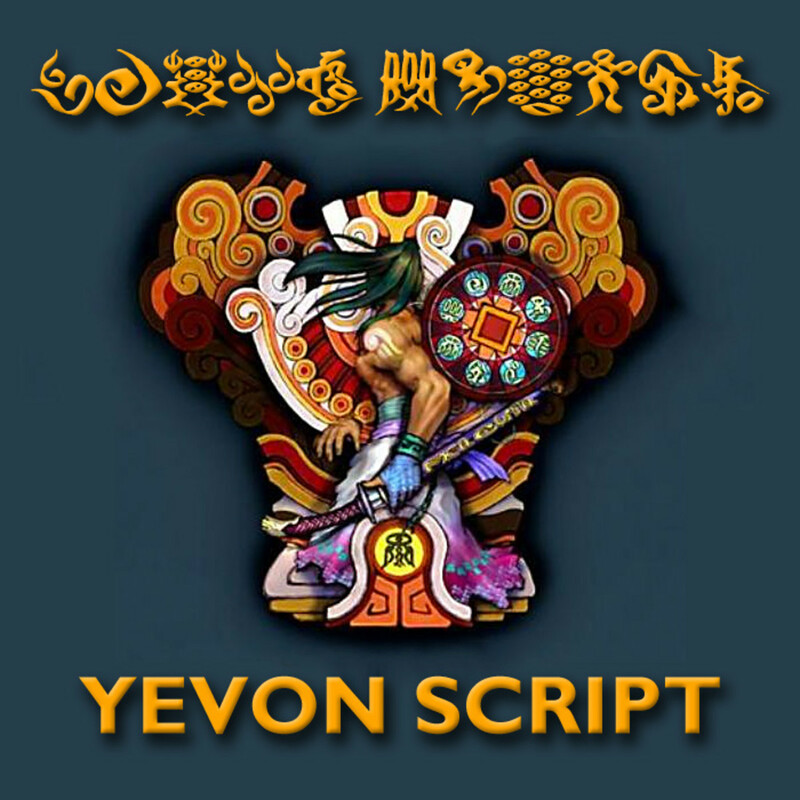 How about all those Yevon script characters that flash out during the "1000 Words" FMV in Final Fantasy X-2? Well, I confess I haven't taken the time to decipher the whole panel, because there's an awful lot, but a quick scan shows alphabet soup. The exception is the set of characters that light up when Shuyin first punches the psychedelic keyboard. Above the cockpit, most of the "fundamental forces" signs light up: Fire, Ice, Lightning, Light, Mu, Darkness. I don't think we need to read overmuch into this. It's a doomsday weapon with a pipe organ control panel. 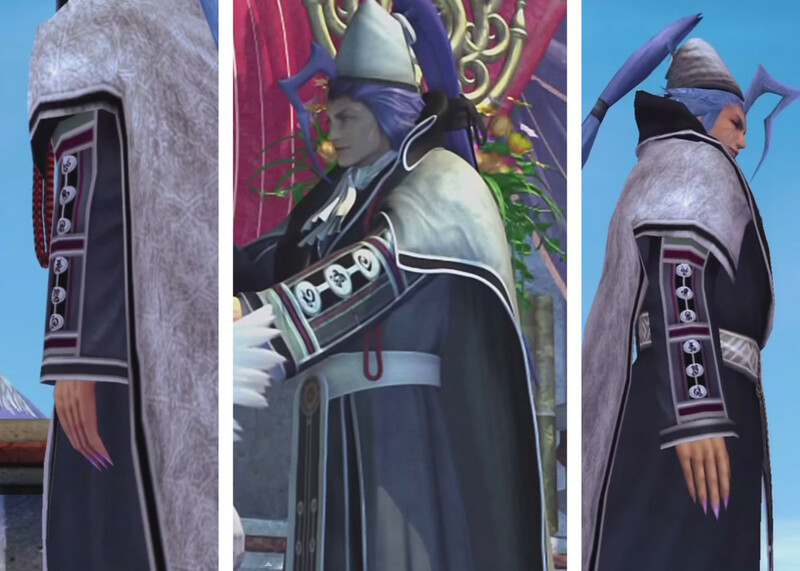 Everything about Vegnagun screams, "I look fabulous." Including the butterfly wings. Sometimes, a pipe organ is just a pipe organ. It's simply there to look magnifcent. 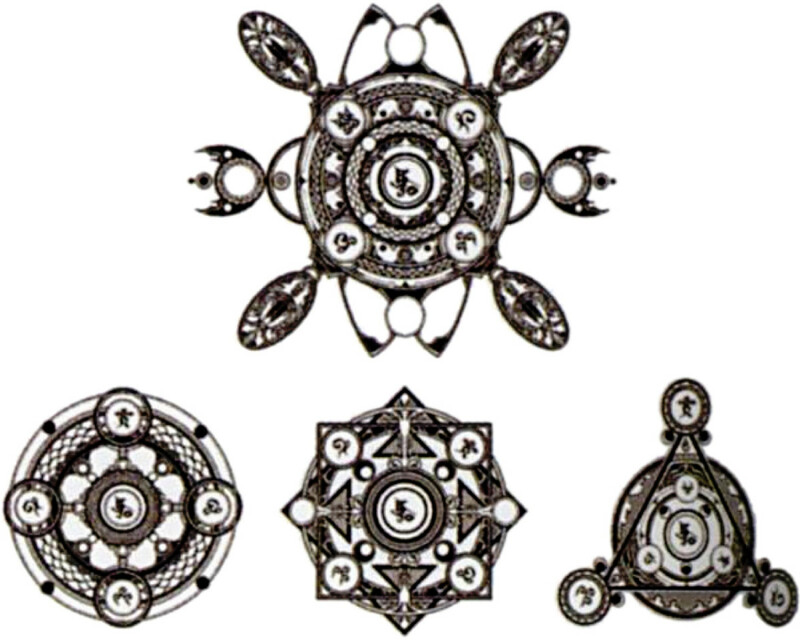 You may recall my earlier version of this tour where I talk about Shingon Buddhism, and how it sheds light on the relationship between aeons, Yevon Script and summoning mandalas. I've moved that post to its own page, Part IV. 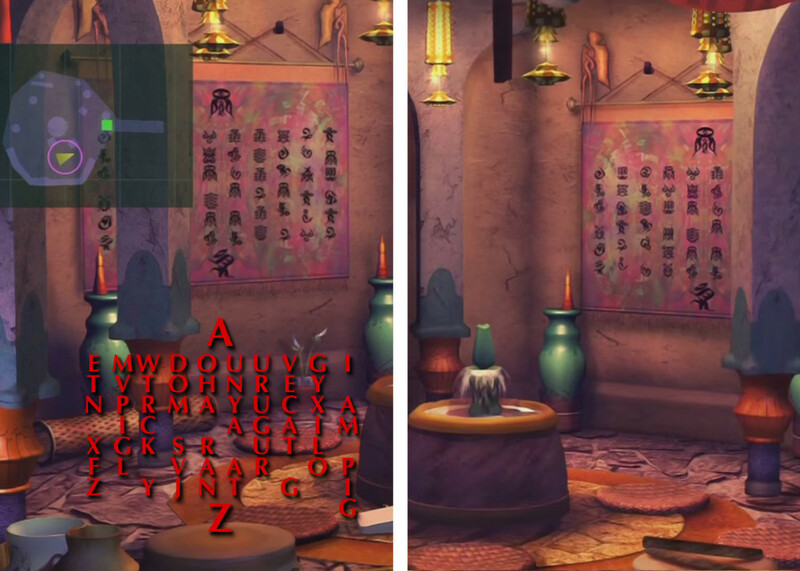 Did you notice that the right-most text in the left-side Besaid Temple's room, when read from top to bottom, says 'I am Pig' ? Just thought I'd share this because it was driving me nuts. 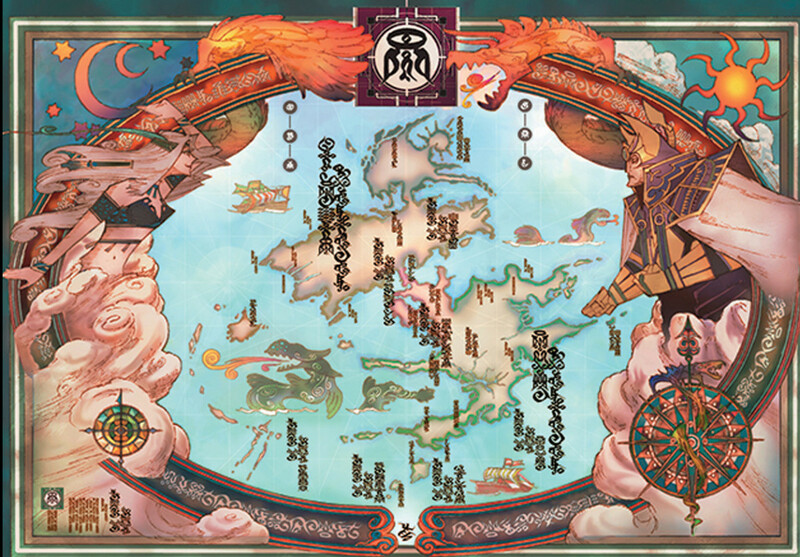 The plot of X takes us right through the middle of Spira, and huge swathes of it are just ignored and unnamed (here's a hopelessly slapdash illustration of that fact: http://imgur.com/jXPVdtC), so when I saw those tiny labels on the map, I figured deciphering them might reveal the names of some of those peripheral locations. Obviously I was pretty disappointed in the end, but whatever. 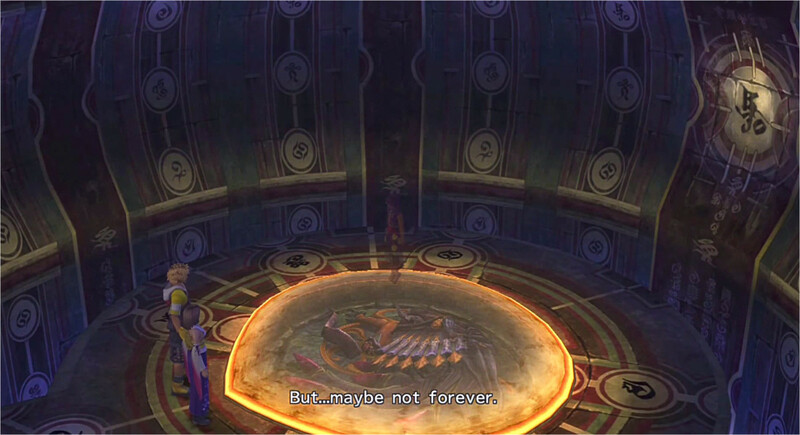 Hopefully X-3, if it ever happens, will give us the opportunity to explore more of Spira (I'm thinking a Hypello hometown's gotta exist out there somewhere! ).